The bio-photovoltaic panel consists of a battery in which energy is harvested from bacteria inside the soil to release electrons. 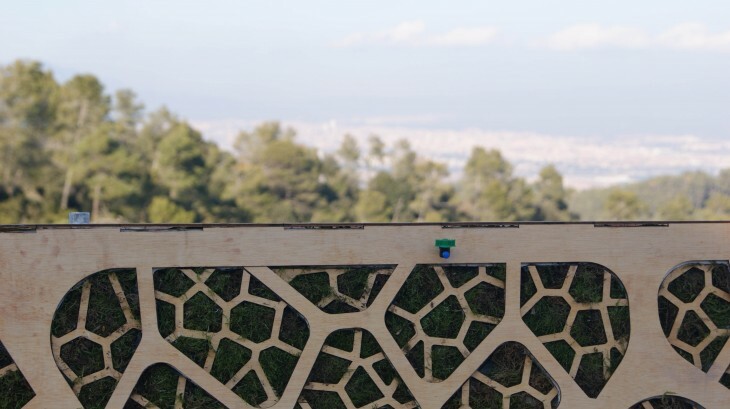 Installed at the Valldaura campus of the Institute for advanced architecture of Catalonia, the system has sensors that display its status, as well as make it self sufficient. The bacteria is fed through by-products from the photosynthesis of plants, and by introducing an anode and cathode (battery) into the soil, the free electrons can be extracted and put into the circuit. 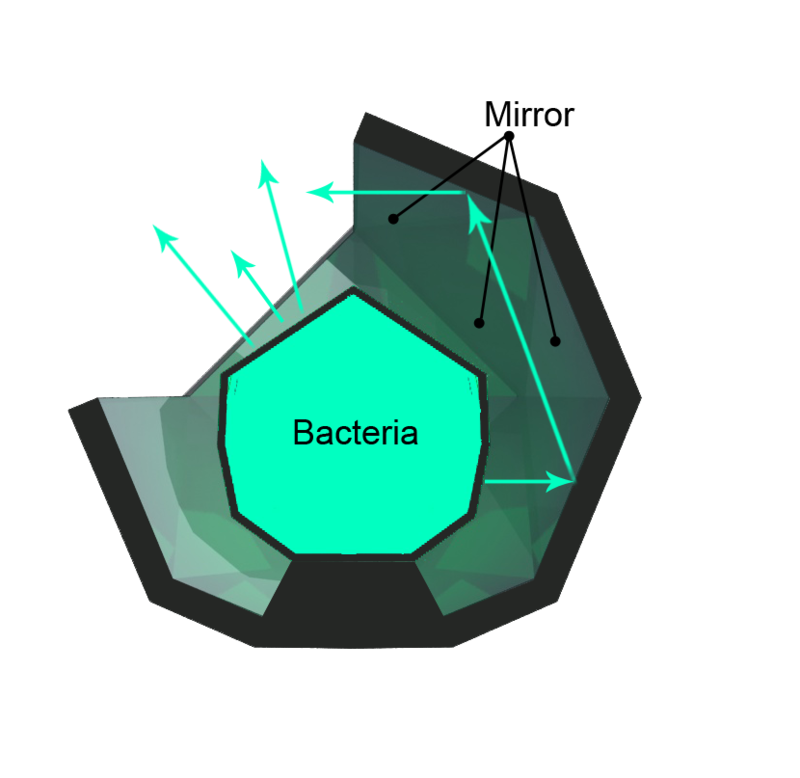 Bacteria living in the soil takes these plant nutrients and metabolizes them, releasing hydrogen protons and electrons – the introduction of a microbial fuel cell, anode and cathode means a redox process occurs, transferring the free electons in the soil from anode to cathode. By connecting a circuit with a capacitor or step-down converter into the fuel cell, it is possible to use this source of flow to power appliances or any other electrical device. Each of the components that form the BPV have certain parameters that may be changed to control the processes and efficiency of the output – the type of plant that grows, whether its edible or decorative, the soil characterístics that enable microbial growth, the type of soil that makes the electron transfer, and the battery’s materials and composition all help to determine the efficiency for the way the electrons are gathered and transferred. 1. 100% saturated soil produces the best results since the water in the medium promotes electrolysis within the soil. 2. The closer the anode and cathode are placed the more efficient the electron transfer is. 3. The relationship between the soil volume and the cathode’s area does not grow as volume grows. 4. A triangle container is more efficient. 5. The coil cathode maximizes the surface for the bacteria to gather around, hence it is the most efficient electron collector. 6. All soil types yield similar results, hence have similar bacteria count. Voltage and amperage were measured in all the experiments, and even though voltage was always present, no amperes were observed. The containers were connected in series to increase the voltage and still there was no amperage. To get amperage, the batteries must be connected to a capacitor or step down converter. 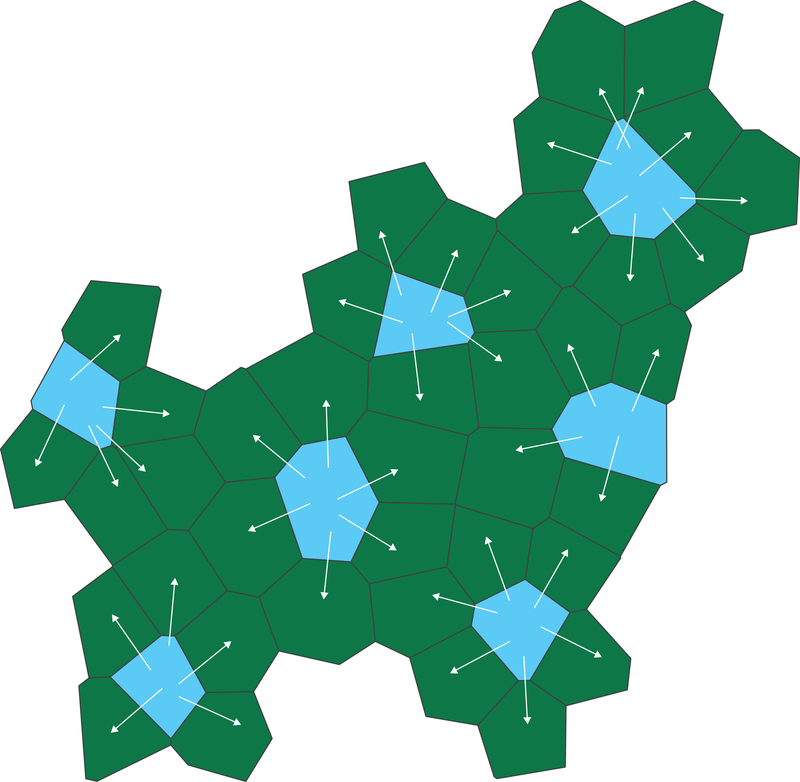 The irrigation system incorporates a voronoi tessellation, making it possible to reach more plant cells (batteries) with only once cell of water. To ensure that all of these were kept at a 100% saturation, a water base was created to connect the plant cells with the water cells via a tube, and also keep the water bed height constant throughout. Having tested the different components and networks in previous prototypes, the final one incorporates an automation system that controls the irrigation and a data logger to monitor the variables that affect the plant’s growth. A customized design was also developed where the user can create his/her own panel design and send it to be fabricated to the fablab. The fabrication procedure consists of milling the panel in polysteryne and applying coats of ruber and epoxy resin to stiffen and waterproof it. 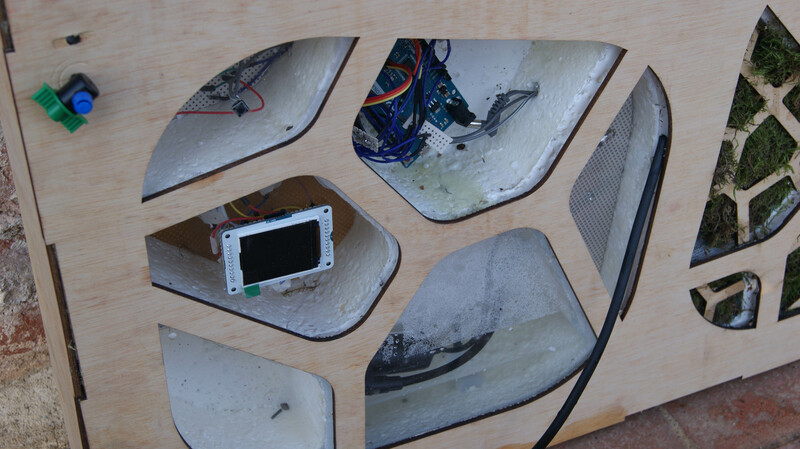 Afterwards, the wiring and electronics are assembled and the soil and moss placed. finally, the finishing is laser cut and glued to the exposed surfaces. 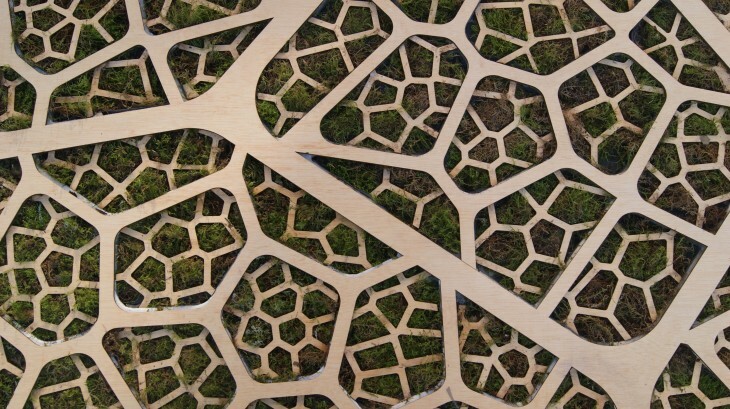 The prototype incorporates the voronoi pattern in three different levels of the leaf – each vary in size, the first one is big and gives rigidity to the piece, the second subdivides the different battery clusters, and the third, the smallest, contains the battery cells. an arduino is powered by the batteries and controls the sensors for the data and water pump of the irrigation. Each panel is 2x1m and 10cm thick made of polystyrene coated in epoxy resin. A wood finishing is applied to give coherence and rigidity to the whole. 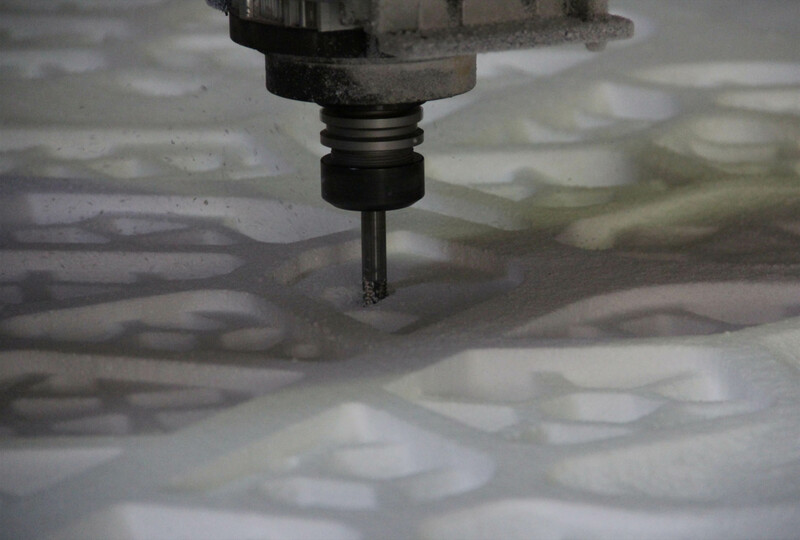 The fabrication process starts with the design of the panel and 3D model, which is sent to the milling machine to turn it into a polysteryne panel of 2x1m and 10cm thick – a process that takes 9 hours. When the polysteryne is milled, it can move along to be coated in latex, firstly close to the pores so that less epoxy resin is needed. After the resin is applied, the circuit is connected with each of the small voronoi cells, containing a galvanized steel wire coil as anode and a copper wire coil as cathode. These are joined in a series with the surrounding the cells. after the irrigation system is applied, the wires and plumbing are sealed on the bottom with a layer of fiber and two epoxy resin coats – adding rigidity to the base, while holding the wires and cables in place. Once everything is sealed and water proofed, the saturated soil is placed to make contact with the anode and cathode. Once the soil is in place, the moss is then planted into it in the different individual cells. This afternoon the Studio lead by Claudia Pasquero, Marco Poletto and Carmelo Zappulla, When Energy Becomes Form, presented their prototypes to an international jury composed by Silvia Bures (agricultural engineer), Joan García (GEMMA UPC), Tomasz Jaskiewicz (TU Delft), Manuel Kretzer (ETH Zurich), Mitchell Joachim (Terreform NY), Josep Muntañola (ETSAB UPC), Enrico Dini (D-Shape), Manuel Gausa (IAAC Dean) and Areti Markopoulou (MAA Director). Energy is at the centre of the development of the contemporary urban landscape, however we are facing a situation where the energy structures of these cities are often segregated, hidden from the places of urban life. 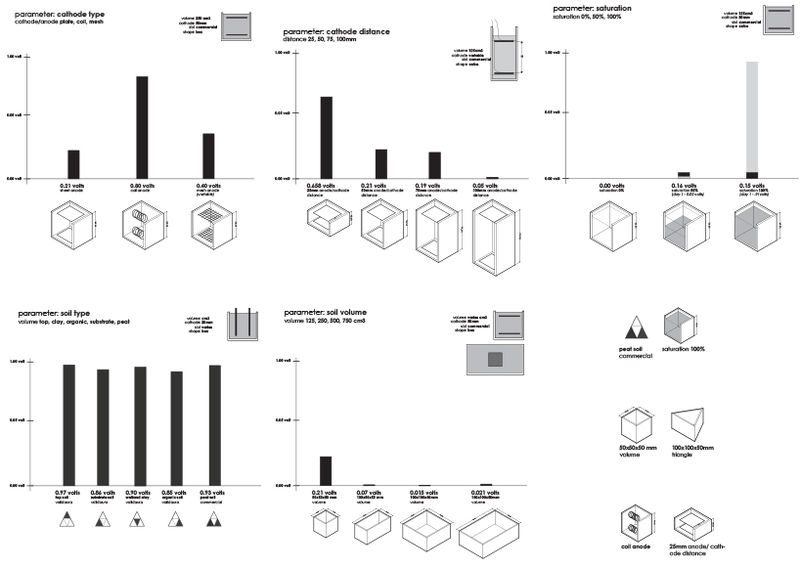 The bio-technological Prototypes presented aimed to subvert this paradigm of segregation, through the study of morphology, materiality and aesthetic novelty generating the emergent qualities of specific flows of energy and information. Our first design trial was based on experiences we did to increase the effect of a light similar to the light created by bioluminescence. We used for this the liquid found in glowing sticks: a mix of Phenyl oxalate and fluorescent dye solution that react when in contact with Hydrogen peroxide solution. The presence of mirrors and water around the source of light increases its effect. We therefore decided to create a double recipient in Plexiglas, the inner part would contain the bacteria, and the outer part water surrounding the source of light, as well as mirrors on the back side as to increase its effect, the angular shape was based on an hexagon. GreyLess designers hiked to Valldaura for a pre-installation site visit to determine an ideal location to place the phytodepuration system. The ideal location would be adjacent to: crops that need to be irrigated, water tank, and visible from the house. After the site visit we acquired more information about the tanks that can be accessed. Currently, two rain water basins about 2 meters from the back end of house provide the house with clean water. 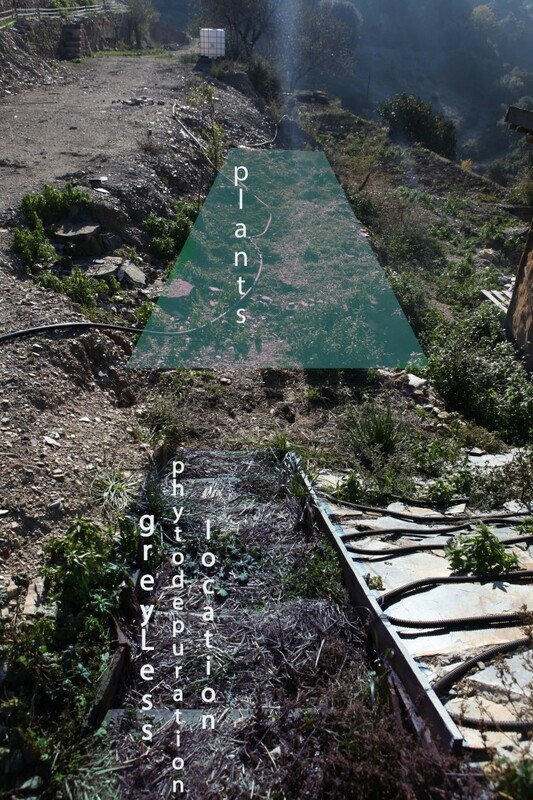 Farther into the forest resides a black and gray water tank that are combined and unaccessable. In the future, the residents of Valldaura plan to separate black and grey water tanks. For this installation we will use the existing water tank to simulate grey water that will flow through our system. 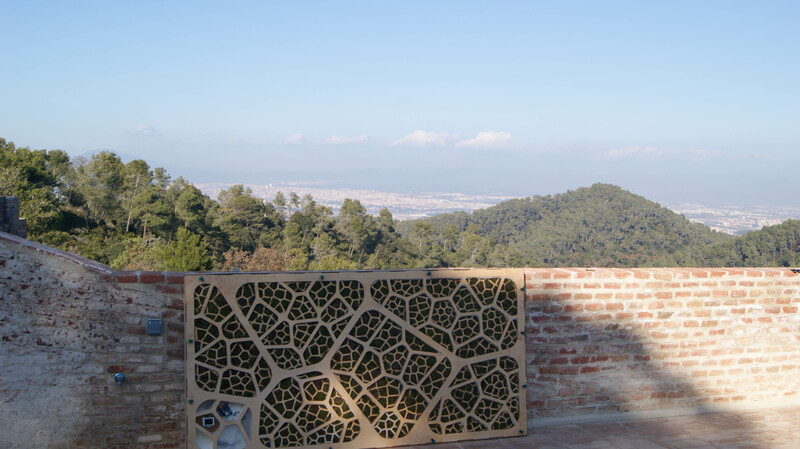 The goal of the installation to be done is to do a surface of bio-photovoltaic panels that may be applied to any surface and produce both electricity and food (mainly herbs). In previous prototypes the surfaces were tessellated by using a Voronoi tessellation. This would allow us to efficiently irrigate the plants by keeping the best ratio water cell to plant cell being irrigated as shown in the following diagram. 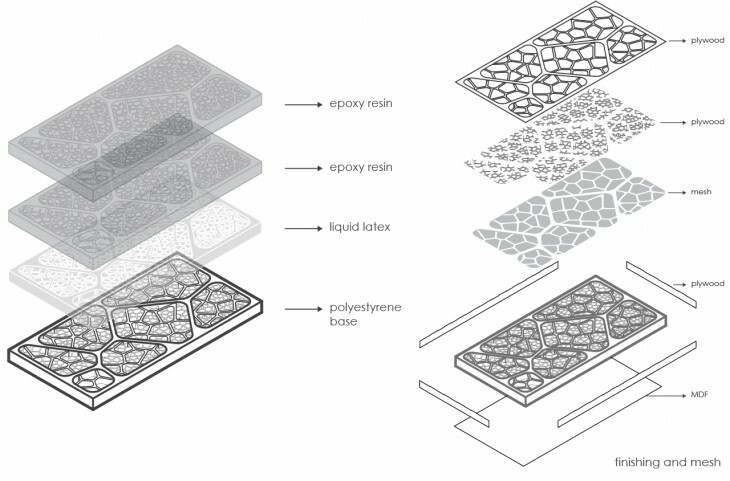 Water cells are optimized for water distribution to plant cells.